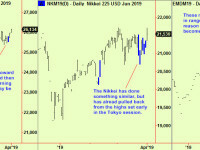 It is usual for markets to make some kind off 'top' before they can start to fall. That hasn't happened here. 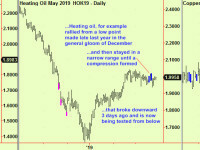 The answer is probably to protect profits on long positions, as we have been advising for the past week and to expect that prices will struggle, even if they don't drop (yet). If you are a shorter-term player, it seems sensible to trade from both sides now - both buy dips and sell rallies for the immediate future. Risk is shifting to the downside here. The FTSE has not gone up since our 'buy at market' recommendation in the January 15th edition. It has stuttered and stalled, recompressing several more times. 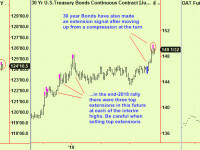 In light of these other equity market top extensions, we are inclined to abandon the trade. Here is an update, showing the original compression (ringed) and the return-to-compression that made us want to buy it (arrowed). There have been three subsequent compressions, as shown. 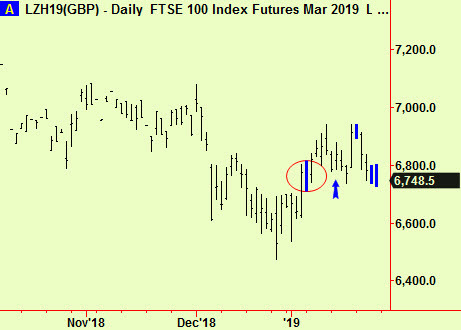 This has the usual meaning - this rise in the £ is likely to stall hereabouts which (if it happens soon) would support the FTSE as have most bouts of weakness in the £ since the Brexit referendum. Don't risk much though, as the original reasons for taking a long position in the FTSE have now gone. We will probably take a short position in the £ in the near future as top extensions in currencies usually don't need a 'top' to form before the market can reverse - a top in one currency is a bottom in another after all and we are quick to act on bottom extensions. We may not advise further on this, so if you see a reason to sell the £ soon, do so. 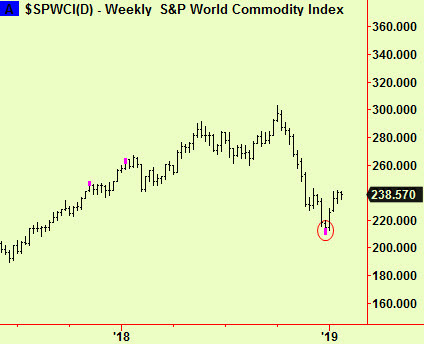 This makes us think that there is much further room for prices to rise in various different commodity markets and we will try to identify which ones these will be as time goes by. For now, keep long of all of these (and any others you may have bought) but don't risk much in Corn. If that doesn't start to move up soon, we will try to find an alternative market to buy. 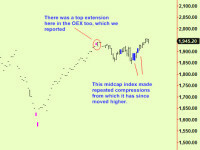 First top extension in stocks – Canada!